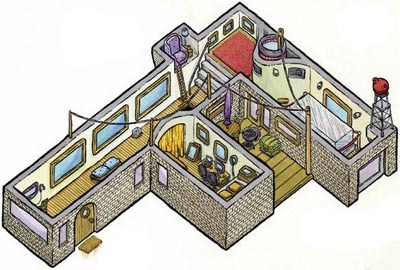 Following up on the recent post about my own illustration and comics drawn using isometric projection, here is a survey of work by other artists using isometric methods (not all of which conforms strictly to formula, but these guys are cartoonists, illustrators, photographers and fine artists, not architectural draftsmen). The great Dutch artist M.C. Escher exploits the visual ambiguity inherent in isometric in this symmetrical but discordant composition. The left half of the scene is an overhead view, and the right half is seen from underneath. By the way, according to strict isometric construction, the buildings seen through the window at upper left should be at the same scale as the architecture in the foreground. 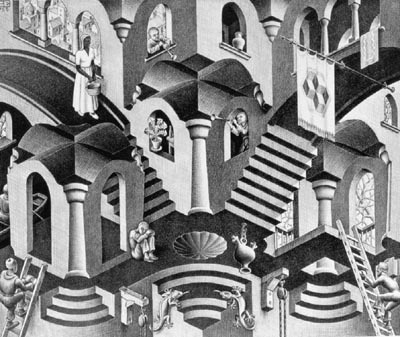 Escher undoubtedly knew the rule, but chose to disregard it- or perhaps we are seeing a miniature through the window? 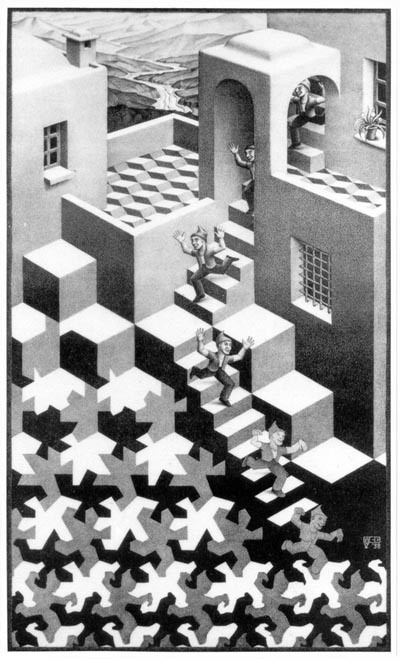 Here Escher combines a perspective top half shading imperceptibly into an isometric bottom half. The isometric cube pattern serving as floor tiles is a clever touch. “Gasoline Alley” creator Frank King specialized in spectacular Sunday pages, including this backyard scene. Autobiographical cartoonist Joe Matt usually documents his love life, but in this page from his collection Peepshow: The Cartoon Diary Joe Matt , he puts himself through an isometric obstacle course. 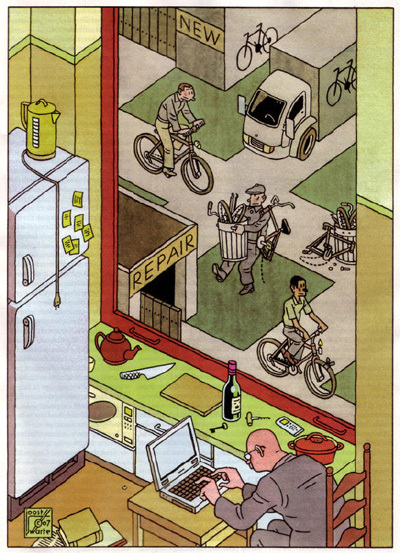 Like Escher, Dutch cartoonist Joost Swarte bends the rules when he sees fit; the lines in this illustration follow isometric angles, but the figures seen out the window are at a smaller scale than the man at the table. “Jimmy Corrigan” cartoonist Chris Ware hardly ever uses perspective; instead he favors a variety of paraline drawing methods, including isometric. New York illustrator Scott Teplin mixes meticulous rendering with visual wit. This tidy apartment doubles as the letter ‘F’. Photographs can have an isometric appearance, provided they are taken with a sufficiently powerful long-distance lens tipped at the right angle. This shot of Toronto by Understanding Comics: The Invisible Art author Scott McCloud would not look out of place in “The Sims”.